A new survey released by the Kaiser Family Foundation and Episcopal Health Foundation is the latest confirmation that Texans want the Legislature and Governor to take action to reduce the state's high uninsured rate. As reported in the Texas Tribune and other media outlets, the survey results show that Texans overwhelmingly want the state Legislature (rather than the federal government) to work on health care. The findings demonstrate that Texans believe it's important for state leaders to work on several challenges that are linked to the state's high uninsured rate, including individual health care costs, maternal mortality, the opioid crisis, mental health, access to rural hospitals, and more. Nearly 9 out of every 10 Texans (87 percent) believe that increasing access to health insurance is either a top priority or important. As we discussed in our recent blog post, more states around the country are accepting Medicaid expansion funding from the federal government as a strategy for addressing these problems. 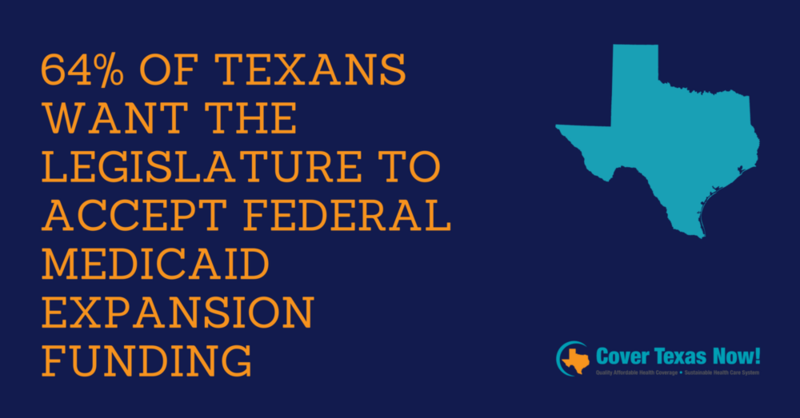 Almost two-thirds of Texans (64 percent) believe the Legislature should accept federal Medicaid expansion funding. And nearly 8 out of 10 (79 percent) believe that "[e]xpanding Medicaid to cover more low-income Texans" is either a top priority or important. The results show a high level of overall support for Medicaid, with 7 out of 10 (71 percent) expressing a very or somewhat favorable view of the health insurance program. The survey echoes previous polls of Texans, such as the 2016 survey showing that 63 percent of Texans favor Medicaid expansion. We believe it's time for state leaders to listen to the voters and start solving the challenges created by the state's high uninsured rate. Whether it's through Medicaid expansion or a different Texas approach, the Legislature and the Governor need to get to work on a health coverage plan.